A natural disaster like Hurricane Harvey always brings out the very best and the very worst in people. The same goes for companies of all sizes. While many companies are pitching in with large donations of cash, manpower or badly needed supplies, other companies are making the news for all the wrong reasons. 1st prize for the biggest blunder goes to Best Buy who was caught price gouging in the flood zone. Reporter Ken Klippenstein went viral with an image showing a $42 price tag on cases of Dasani Water. Can’t handle that? A case of Smart Water is only $29 – but hurry (says the sign) because supplies are limited! We all understand the law of supply and demand, but during a crisis it’s always better to give than to receive. More than 3,000 people retweeted the post in just 48 hours leaving Best Buy’s corporate office with quite a mess on their hands. In their rebuttal statement to the press, Best Buy said it was a mistake that happened when an employee multiplied the individual bottle price by the number of bottles in the case. Since they don’t unusually sell water by the case, this was an easy mistake. The easiest way to correct the error? Don’t put a price on the water at all! Donate it to people who need it. Or give it away to everyone who comes into the store because it’s hot out there! It’s not a flat screen TV, Best Buy; it’s water. Even if we take Best Buy at its word, that this was a simple mistake by an untrained worker, and not an act of price gouging, it doesn’t make things better. As we’ve said many times before, it’s not the reality of what you do, it’s how people perceive your actions. If it seems like you’re being mean, that’s the impression people are going to walk away with. Think about it this way; how many people have seen (or will see) that price gouging photo vs the number of people who have read Best Buy’s apology? Takeaway Tip: when a national tragedy consumes our county, reach out to all of your employees with a plan of action. Solicit ideas for how to help and assign a point person to handle donations. From Maine to Hawaii – what’s happening in Texas is on everyone’s mind, so its no time for business as usual. Talking about perceptions, let’s discuss perceived indifference. This is when it appears that a company or celebrity is blatantly ignoring a disaster that has captivated the world. Here you are, scanning your Twitter feed; scrolling through dozens of flood images and pleas for help. Then you hit a post from Miss Celebrity Star who can’t wait to show off her new $3,000 designer shoes! Ouch. It could be that her post was scheduled by an assistant long before the rains came. Miss Star might have secretly donated $10,000 for flood relief, but all her former fans are going to remember is her celebration of consumption while so many have lost everything they own. Takeaway Tip: when tragedy strikes, bump or delete all of your scheduled posts. That cookie recipe might not offend anyone but no one will pay attention to it, either. Play it safe and use your channels to share helpful information and news about how your company is responding. Right now, a lot of retailers are responding by running “percentage of sales” campaigns. Some are donating a percent of all sales on a specific date. Others are giving away all of the profit on specific items. These programs help consumers cut through the donation confusion and “give now” fatigue. Donating through a favorite retailer, or even a celebrity crowdsourcing campaign, makes people feel like they’re part of something big. Oddly, it feels less anonymous to buy a bracelet where 10% goes to charity than to donate money directly to the Red Cross. 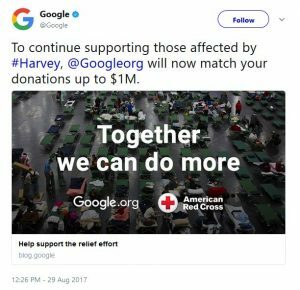 Another reason consumers like these campaigns is that companies often match the donation, so a small donation goes a long way. There are two potential pitfalls with this type of public offering; breaking the consumer trust and benefiting from a natural disaster. “Percentage of sales” campaigns must be carefully worded so it doesn’t look like it’s a ploy to bolster sales. One way to do this is to choose a charity that fits your brand. For example, if you sell children’s clothing, donate the money to The Texas Diaper Bank. Restaurants could give the money they collect to a food bank. Whatever charity you choose, be transparent. Your customers are taking you at your word, that the money they’re donating through their purchase will actually get to the people who need it. Be upfront about when, how and to whom you’ll be donating. After the fact, post a follow up online with the numbers and a quote from the agency that received the funds. People want to help, but they’ll hold it against you forever if they feel like they’ve been duped into giving under false pretenses. A final reminder; the crisis in Texas is going to continue long after the rains are gone. Helping now is wonderful but helping again a month from now, or two months from now, will earn you a gold reputation star from us. Business is business; but when disaster strikes it’s time to put people way ahead of profits. Our trust in the internet is changing, is your brand ready to stand out? Who do you trust? Your spouse? Your best friend? Facebook? Your bank’s app or your health insurance website? Be honest – do you ever worry about typing your password on a login screen or clicking a link in your email but you do it anyway? The very word ‘trust’ doesn’t mean what it used to. Trust was a sacred bond between you and another person or a company. Now, it’s nothing more than a niggle in the back of brains when you’re typing your password into a login screen or clicking a link in your email. How did this happen? 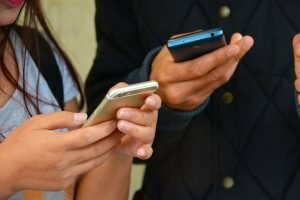 According to the experts in a recent Pew Research Center study, the internet is forcing us to redefine the definition of trust and that’s both a good and a bad thing. Pew got hold of more than 1,000 experts to ask them their thoughts about the future of the internet and more specifically – our ability to trust the internet with our personal data. 48% of respondents said that in the next ten years, our trust in the internet will be strengthened. That sounds terrific, until you dig a bit deeper into their answers. Some experts said this increase in trust will be well-deserved because online companies will be forced to invest in new technology that will make transactions more secure so they don’t lose customers. But a “significant share” of respondents said that the future us will simply delude ourselves into believing a site is trustworthy because it’s more convenient to do so. 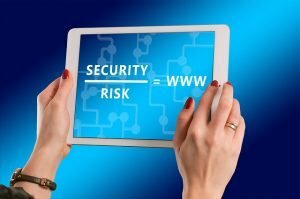 Think about it: would a data breach stop you from shopping on Amazon? Would having your credit card hacked stop you from banking online? Would having your identity stolen stop you from posting on Facebook? If you’re over 40 in 2017 – any one of those might give you pause. If you’re 22 in 2030 – it’s just the chance you take. You deal with it and move on. Now, all of this might sound like good news for online businesses. Trust is a huge part of your company’s reputation; if trust no longer matters then you’re home free. Is that really how you want people to see your business – as a necessary evil? The cell phone company that they hate but stick with because it’s too much trouble to switch? It’s time to turn this ship around. The more customers become blasé about online security, the more vigilant you must become. When they accept shoddy workmanship, late deliveries and poor customer service as “just how it is”; you have to fight back with quality goods, fast deliveries and exceptional service. That’s how you go from being “worth the risk” to being a safe port in big, scary, dangerous sea. Eventually, starts right now. What changes can you implement before the end of the year that will increase customer trust in your business? 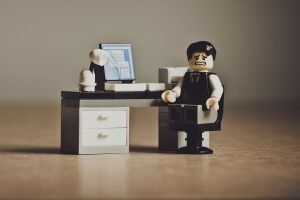 Is it fair for employers to set rules for your personal social media posts? Posting nasty comments about a client or advertiser on a company’s social media channel is a fast click to the unemployment line. But what if you posted the same nasty comment on your own personal Twitter account? Is that grounds for dismissal? If you work for the Washington Post or dozens of other media outlets, it could be. According to The Washingtonian, the Post’s new social media policy prohibits employees from posting any social media content that “adversely affects The Post’s customers, advertisers, subscribers, vendors, suppliers or partners.” Doing so could lead to disciplinary action “up to and including termination of employment”. This may sound unfair, harsh and in conflict with freedom of speech but there are a few angles we must consider. In the present day (where we’re all living), the dividing line between our business life and our personal life is mighty thin. And when you’re talking about reporters, teachers and freelancers, that line is non-existent. Have you ever read the bios people put on their social media account? Even though they’re personal accounts, a large number of people include the name of their employer in their bio. It’s nice to see people who are proud of their work, but when they include this information on a public channel, the employee and the employer become socially and often awkwardly intertwined. Let’s set aside those horrendous, ‘what were they thinking’ posts and talk about average, everyday venting. Suppose Steve, the bike rider from the Bugle, gets sick after eating lunch at Anytown Buffet, then posts an angry rant on Instagram including video from the hospital. Think the Buffet is going to run their full-page ad in the Bugle after that? I’d like to think that people aren’t this vindictive but when we’re wounded, we tend to fight back using the biggest club we can find. In this case, rather than challenge journalist Steve directly, the Buffet puts the pressure on Steve’s employer, hoping they’ll meddle in Steve’s business and make the offending post go away. I know that sounds a bit Machiavellian, but imagine how you’d feel if an employee of one of your clients or customers posted unkind words about you on social media? Would you give the employer a pass? What’s hard about implementing such a harshly worded social media policy is that it could backfire. Especially when you include a clause imploring employees to point fingers if their co-workers break the rules. (Yes, really.) Is there a better way? Yes. Ask, don’t tell. Most employees don’t set out to destroy your company’s reputation. They lose their temper or have something important to say and they don’t even consider the ramifications. So, instead of stringently forbidding your employees from posting what they want, ask them to kindly think twice before posting any content that might embarrass the company. You can also ask employees to post a social media disclaimer (views are mine. . . sort of thing). Though this won’t save you if they go way off the rails, it’s a good, first line of defense. As you build out your social media policy for employees, don’t forget to mention the good along with the bad. A VP might be excited by soaring sales, but posting financial information could get you all in trouble with the SEC. Bottom line: in the last five years, social media has been a swift and vicious reputation killer. In a few cases, the poster set out to stir up trouble and there’s nothing you could have done to stop it. But in most cases, the offending post was a careless thought, a joke or taken out of context. Those are the incidents that could have been squashed with a little social media training. Here’s your homework for the week: dig up your social media policy (or write one if you don’t have one) and send it out to all of your employees. Then, if possible, hold a staff meeting to review the policy so you know everyone – literally – got the memo. And while you’re on the social media wagon, change the passwords on the company accounts because I can bet that most of you have never changed them since you set them up, years ago. I know you’re busy, but spending a few hours getting your social media house in order now, beats spending weeks digging out from under social media blunder. A perfect 5 stars can hurt sales, so what’s the ideal score to achieve? Every business owner hates to see negative reviews but a new study shows that having a few blotches on your, otherwise pristine, reputation might actually be good for your bottom line. Let’s call it the “Too Good to Be True” syndrome. Spiegel Research and PowerReviews teamed up on a project to see just how online ratings affected the sales on three different ecommerce sites. Two sites sold low price consumer products and one sold high-end gifts. Right out of the gate, they proved a point we’ve always known: that people are more likely to buy products that have reviews than products that don’t. But here’s what incredible; a product with just 5 reviews is 270% more likely to be purchased than a product with zero reviews. As we discussed a few weeks ago, Spiegel also noted that reviews had an even bigger impact on high-priced items vs low price items. Customers also take reviews more seriously when the product involves health and safety (baby products, weight loss products) or if the product or business is brand new. Right now you’re thinking, I know all of this. Reviews are important, but when you open yourself up to reviews, you risk getting the bad along with the good. Is it worth it? 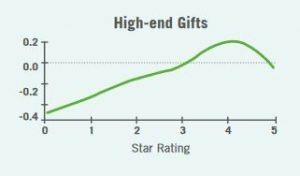 The researchers found that for most products, intent to buy increased along with the number of stars – up to a point. Once the average star count hit 4.2, intent to buy began to decline. The closer the reviews got to being perfect, the lower the intent to buy. In other words, consumers don’t believe in perfect, so they’re suspicious when they see nothing but glowing reports on a product or business. Check out the massive drop-off in the high-end gift category. It’s enough to make a retailer sabotage their own 5-star reviews! 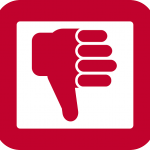 The research shows that 82% of customers actually look for negative reviews and spend 4 times as long on a site when they find them. This may seem like we’re living in a cynical society but it’s actually a smart way to research a product. If I’m thinking of trying a new restaurant, I’m not interested in all the happy people. I want to hear about the problems, so I can decide if it’s still a good fit for me. Not kid friendly? Good, I was hoping for a quiet, romantic evening with my husband. They don’t serve alcohol. I don’t drink, so no problem. Food was lousy? 10 other people said it was great, so I’m not worried. The restaurant manager is probably freaking out about those 3 bad reviews, but I feel like I have a true picture of the experience and it works for me. Reservations for two, please! This does not mean you should ignore bad reviews. When you can, address the problem publicly, even if it means apologizing when it wasn’t your fault. Future customers will appreciate the effort. Whatever you do, don’t snap back, don’t argue and don’t respond to trolls. Trust that your real customers will know a phony review when they see one. When it comes to online reviews, perfection is overrated. What customers really want is credibility and that comes with an honest mix of opinions from those that love, like, hate and can’t decide how they feel about your product. There was a time when working for an airline seemed adventurous and glamorous. Now, it’s tantamount to working in the 9th circle of hell. CEO of a Silicon Valley startup? Might sound better to say you’re unemployed. No doubt about it, it’s been a rough year for several major industries including casual restaurants, the automotive industry and retail chain stores. So what happens to your reputation if your company is part of an industry that’s sporting a black eye? Can you stand on your own unblemished record? Probably not. The truth is, even though it’s only a handful of troubled companies that make the news, consumers have a tendency to hold widespread grudges. It’s particularly tricky in industries with only a few big names such as airlines and banks. When it came out that Wells Fargo was creating fraudulent accounts, everyone started looking a little closer at their bank statement. Those bad burritos at Chipotle, didn’t just affect the other restaurants in the chain, it made diners leery of eating at any restaurant serving similar food. Want to avoid getting a black eye by proxy? There are a few things you can do. You’re less likely to be lumped in with your troubled cohorts if you appear to be something completely different. Traditional airlines are in trouble because the public thinks they’re putting profit before passengers. Imagine an airline that purposely carried fewer passengers per trip in order to provide a more comfortable experience. Imagine an airline that offered first class service at economy prices. Not only would those companies be standouts in their industry, they’d be the ones consumers would point to as examples when the traditional airline gives away another baby’s seat or drags another passenger off a plane. When your main competitor takes a hit, it can be tempting to call them out on social media. “XYZ screwed up? Come over to our place and we’ll take care of you!” Don’t do it. It only makes you look petty and vindictive. You can also be seen as putting down customers who were loyal to the competition. That’s no way to swing them over to your side. Though you don’t want to take advantage of another company’s misfortune, you do want to step up and help make things right for the industry as a whole when you can. For example, an airline that goes out of its way to aid passengers stranded by the competition or hire workers displaced by a hostile takeover. It’s also good to be part of the plan to prevent such a thing from happening again. Form an industry investigative committee or invest in an industry wide safety or training program. The most important factor in dealing with any kind of industry crisis is communication. When your industry takes a hit, call a meeting to talk with your staff. If it’s a large company, give every manager or department head the data they need to talk to their staff. Talk about how the incident might impact your business. This is also a good time to make sure your company isn’t hiding a similar problem. Newsworthy failures such as the VW emissions scandal and the Wells Fargo incident don’t happen over night. They happen because of a series of bad choices and wrong turns which were most-likely triggered by financial, time and other pressures. Give employees the tools they need to report issues with impunity. Make a few surprise visits and dig a little deeper into the people and processes. If you see the early warning sides, you can fix it before it turns into a public #PRFail. When a big company takes a hit, it’s bad for the entire industry. Your company may not be part of the problem but, if you want to protect your reputation, you must be part of the solution.